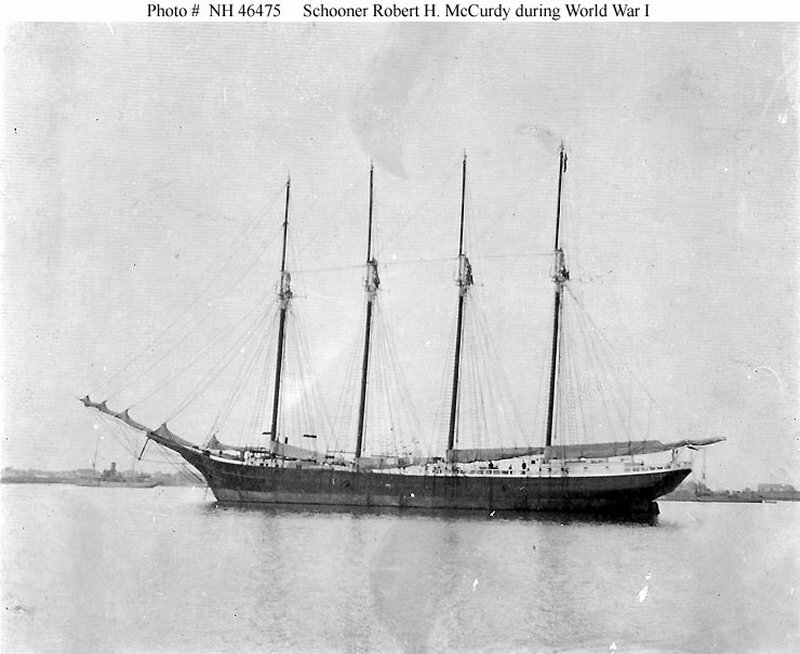 Schooner: Built in 1903 by Cobb, Butler and Co., Rockland, ME; Acquired by the Navy, 25 July 1918 and commissioned the same day; Decommissioned in February 1919 at Philadelphia, PA, struck from the Naval Register and sold. Fate unknown. Specifications: Displacement 735 t.; Length 178'; Beam 37' 2"; Draft 12' 1"; Speed unknown; Complement 32; Armament unknown. 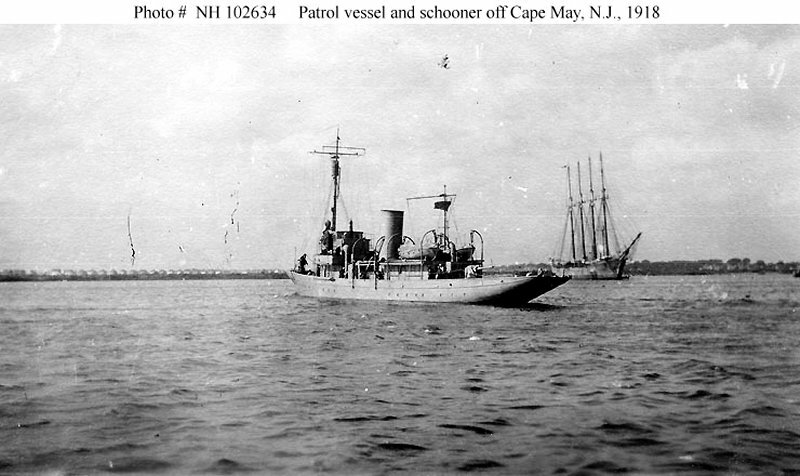 79k Vega (SP 734) off Cape May, New Jersey, circa summer or fall 1918. The four-masted schooner in the right center background is Robert H. McCurdy. Collection of Christopher H.W. Lloyd. Donated by Virginia Agostini, 1990. 83k In harbor, circa mid-1918. This four-masted schooner was employed as an anti-submarine "mystery ship" during the last months of World War I. 84k In harbor, during World War I. This four-masted schooner was employed as an anti-submarine "mystery ship". In the background are a converted yacht patrol vessel (left) and a submarine chaser (right). 93k Photographed in 1918, probably in late July when she was acquired for U.S. Navy service as a decoy ship operating in cooperation with U.S. submarines in an attempt to trap German U-Boats operating off the Atlantic Coast. The three-masted schooner at left is almost certainly USS Helvetia (SP 3096), which was acquired at the same time, for the same purpose. The vessel nested between the two appears to be a lightship. 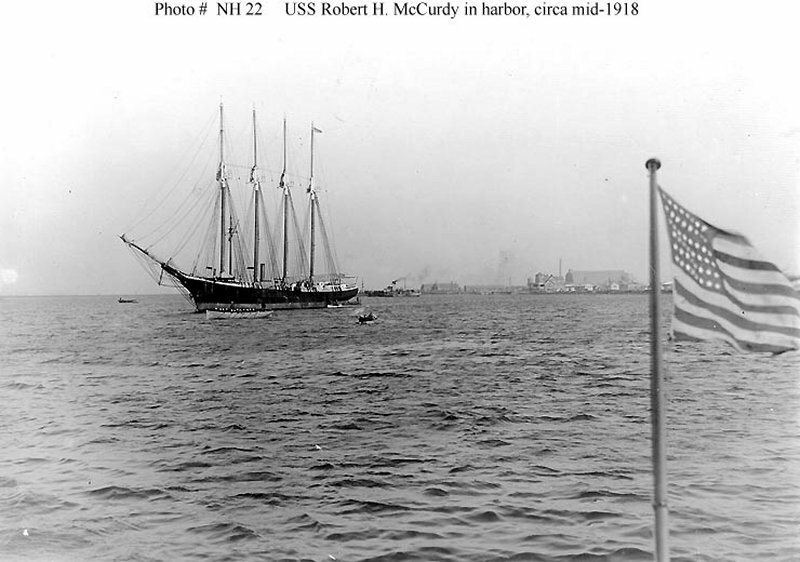 Dictionary of American Naval Fighting Ships: Robert H. McCurdy (SP-3157), a wooden schooner built in 1903 by Cobb, Butler & Co., Rockland, Maine, was purchased by the Navy from W. S. Job & Co. and taken over at Norfolk, Va., on 25 July 1918. Commissioned the same day, Lt. S. O. Fernstron, USNRF, in command, Robert H. McCurdy remained in the Norfolk area until mid-August; then shifted to Lewes, Del. Into October, she operated with the submarine tender Savannah (AS 8), assigned to Division 8, Submarine Force; but, by the end of the month, had taken up duties out of Cold Springs Inlet, N.J. On 29 November she sailed to Atlantic City, whence she participated in clearing minefields east of that resort town until 8 December. 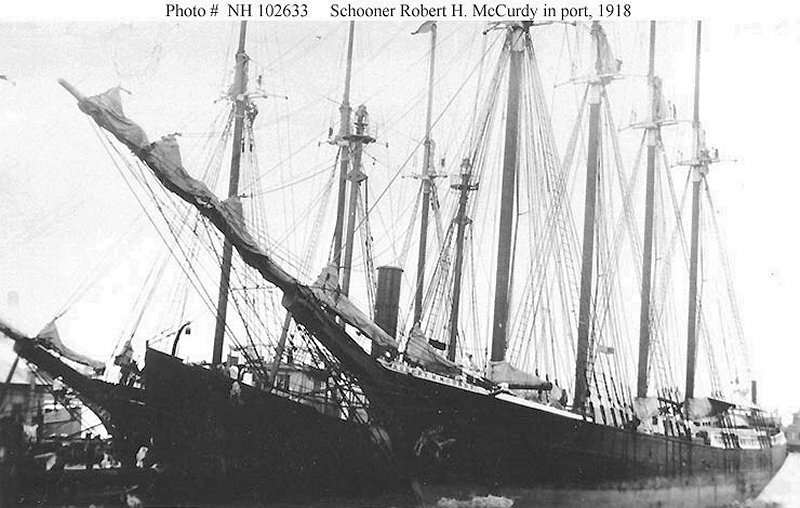 The schooner then returned to Cold Springs Inlet where she remained until towed to Philadelphia at the end of January 1919 for inactivation. Arriving on the 29th, Robert H. McCurdy was decommissioned early in February and was subsequently struck from the Navy list and sold.